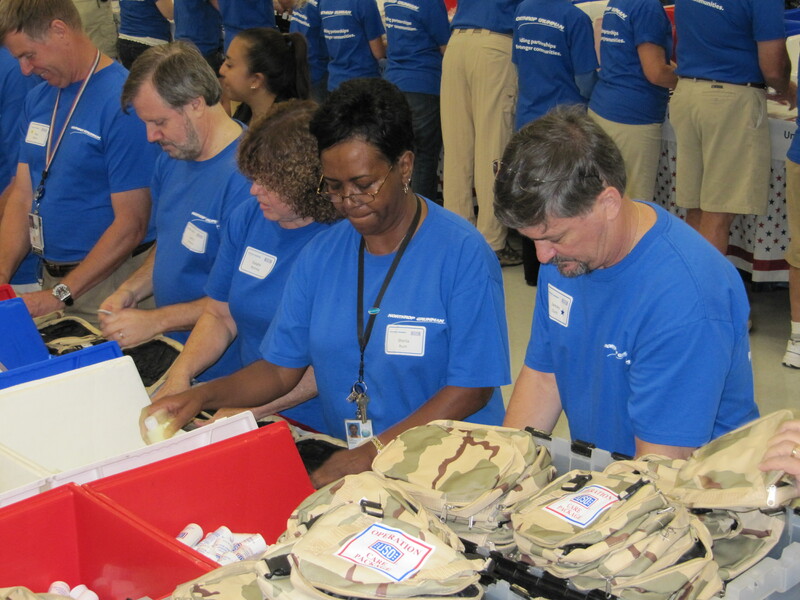 CHARLOTTESVILLE, Va., Sept. 23, 2011 -- More than 10,000 deploying service members will receive "care packages" from the United Service Organizations (USO) thanks to a stuffing party held recently by 130 employees from Northrop Grumman Corporation's (NYSE:NOC) Charlottesville campuses. The event was held onsite in the campus cafeteria at the Naval and Marine Systems Division headquarters for the second straight year. 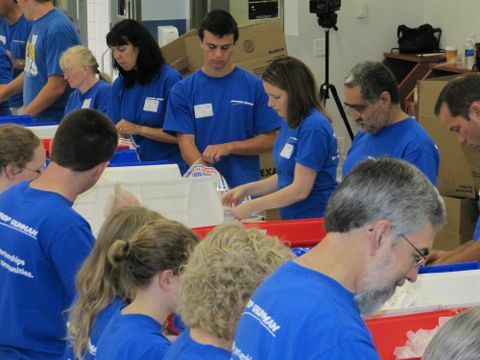 Employees formed assembly lines to fill packages with personal items such as sunscreen, packaged body wipes, granola snacks, playing cards, prepaid international phone cards, disposable razors and chewing gum. For a special, more personal touch this year, the campus held a note-writing campaign designed to personally convey thoughts and sentiments to our troops. Some 10,000 notes containing thoughtful words and a "thank you" were written by Northrop Grumman employees and added to the individual care packages. "Our employees have once again demonstrated their unfaltering support for our fighting men and women by being here today," said Bill Hannon, vice president of Northrop Grumman's Maritime Systems business unit. "We know how much our troops appreciate and look forward to their USO packages, and we hope that we might, in this small way, bring a little bit of home to every one of our sons and daughters out there in harm's way." The USO is a private, nonprofit organization whose mission is to support the troops by providing morale, welfare and recreation-type services to the nation's men and women in uniform. The USO currently operates more than 145 centers worldwide, including 10 mobile canteens located in the continental United States and overseas.